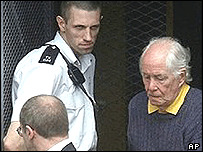 Ronnie Biggs, one of the Great Train Robbers, has been transferred from Belmarsh on "compassionate grounds". The 77-year-old, who is seriously ill after suffering a series of strokes and heart attacks, was moved from the high security jail to Norwich Prison. His son Mike said the transfer came "out of the blue" and it was a victory for common sense. But he does not think his father will ever be released even though he is not considered a threat to society. Mike Biggs told BBC News he was "relieved" his father had been moved from a maximum security jail and he would visit him at the weekend. "My father can hardly walk, will never speak again, cannot eat, drink, read or write but he's still deemed a threat to society," he said. Biggs - who also has MRSA, skin cancer and cataracts and needs 24-hour nursing care - has been held at Belmarsh, in South East London, since returning to the UK from Brazil in 2001. He was jailed for 30 years for his part in the 1963 £2.6m Great Train Robbery. But he had only served 15 months of the term when he escaped from Wandsworth Prison by scaling a rope ladder. He fled to Paris and Australia before escaping to Brazil, which has no extradition treaty with the UK. His lawyers have made several unsuccessful attempts over the years to get Biggs transferred to a lower security prison. The governor of Norwich Prison declined to comment on the transfer and the Prison Service said it did not comment on individual prisoners.